So over dinner one night I told my family I was quitting sugar. Again. I do it frequently and then after a few months I slacken the reins and my sweet tooth takes over. My family are used to hearing about my attempts to quit sugar, but this time was different. This time my six year old decided to join me. Then my three year old agreed (after lamenting that jam was off the menu). Then my husband agreed too. Great! I knew it would be easier with everyone involved! 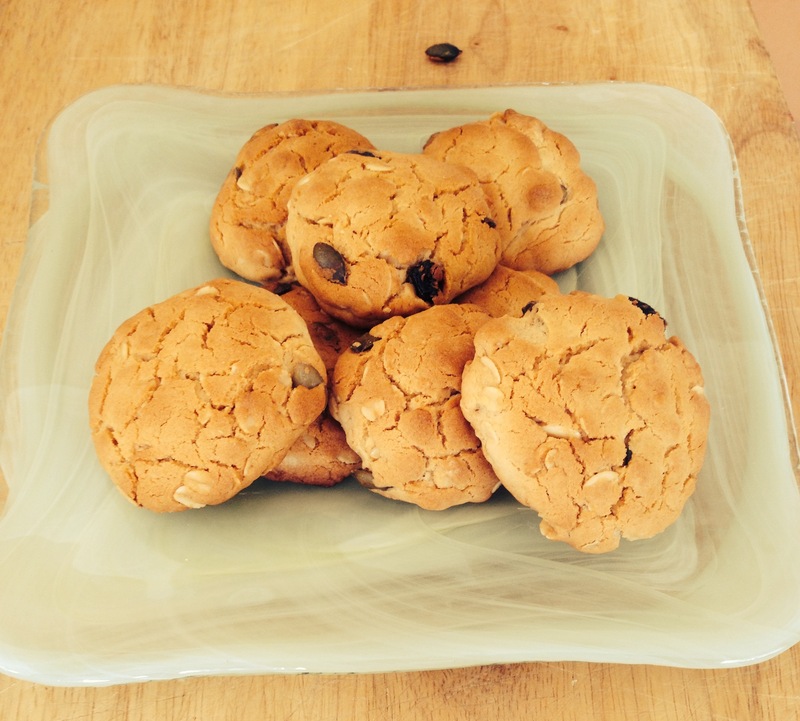 I posted on Facebook to asking our family & friends know not to give the kids any sugar and I set about devising some sugar free lunchbox snacks. Mix all the ingredients together and roll into small balls and flatten slightly. Bake at 180 degrees Celsius for 12 minutes. Couldn’t resist taking a photo of my lunch for work tomorrow. 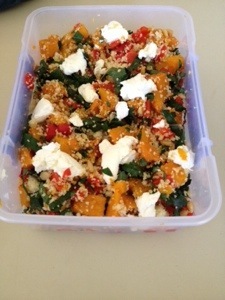 Roast capsicum, roast pumpkin, pine nuts, kale, couscous and topped with homemade quark. Yummo! One day at work almost two years ago, I realised I was eating way too much sugar. I work 14 hour days, sometimes for 6 days a week, and my colleagues and I always got by with a bowl of lollies on our desk. The day I realised I was eating too much sugar, I told two people I was working closely with, that I wasn’t going to eat the lollies anymore. They laughed and said I could never do it. The next day, I arrived at work to find a bowl of lollies on my desk. Not just any bowl, but a bowl about the size of a hubcap (no exaggeration). It was full, with every sort of sweet lolly you could find; jubes, Sherbies, Redskins, Milk Bottles, Bananas, you name it, it was there. My stubborn resolve kicked in, and I was more determined than ever not to eat the sugar. That particular day, we were working from 9am until 11pm, and I watched my two colleagues slowly eat every last one of those lollies, and by 9pm, they were feeling sick, lethargic, and I was feeling great. Not tired at all. I was so proud of myself for not eating a single one of those lollies, and the next day I came in to work, to find a bowl of dried fruit and nuts on my desk. Since that day, I have only eaten the occasional sugar. I avoid it most of the time, except when at special occasions. And I always regret it after. But what’s so bad about sugar…. Well, I’m no expert, all I know is how my relationship with sugar has always been bad for me. Many years ago, a naturopath told me that my excessive eating of sugar was what was causing my eczema. I trusted her, so took a month off sugar. I felt awful. I had no energy, felt like I was hungry all of the time. I couldn’t cope at work so I headed straight back to the nearest chocolate bar. It got to the point, I couldn’t work in the evenings without one. I knew deep down that sugar was the cause of a lot of my energy problems, as well as the eczema, but although I would regularly cut down my sugar, I never stuck with it. Not long after that memorable day at work with a hubcap of lollies on my desk, where my resolve finally outweighed my love of sugar, I heard a podcast of David Gillespie, author of (podcast available here). The light bulb moment for me, was he said that your average tomato sauce has more sugar than chocolate topping. I realised then, that even when I had been steering clear of the obvious sugars, I was still getting it in most other processed foods. From that moment on, I decided to read the label on everything I ate. I limited myself to only products that contained less than 5g per 100g of sugars. Unlike David Gillespie, I still ate natural sugars that came in whole foods, such as fruit and honey. For me, this has been the best nutritional decision I have made in my life. I no longer crave sugar, and when I eat it, I feel disgusting. Recently, some leaked guidelines from the World Health Organisation (see news story here) stated that the recommended daily intake of sugar would be reduced to 5 teaspoons per day. Many people would get that just in their average bowl of cereal. When I told my husband, he realised that he’d already had his quota for the day by the time he had finished his muesli, a meal many consider to be a health food. Halve the sugar found in most recipes (except when making jam), or use honey as a substitute. When eating out, I eat low sugar options, but sometimes dressings etc may contain sugars that I don’t stress about. These guidelines have worked well for me, and when I find that I have a lapse (which I do sometimes), I usually regret it as the sugar makes me feel really sick. So, what has happened for me since that day, two years ago. My eczema is gone (except in periods of high stress, or minor sugar lapses), my energy is much more constant and I find losing weight much easier. There has been some challenges, however, since I started running. I have to find more creative ways to fuel my runs and keep my daily calorie intake up so that I can maintain my energy during long runs. I’d love to hear other people’s stories of how they cut sugar out of their lives, and I challenge anyone to try limiting themselves to 5 teaspoons of sugar (25g) per day for one day. Just try it, if you can stick to it to a few days, you’ll start to feel great. Share your stories in the comments section below. Before tomorrow’s 18.5km run, I thought I’d do an energy bar cook-up using The Ultimate Energy Bar Formula from the No Meat Athlete. As it’s title suggests, it’s a formula rather than a recipe, where you can mix and match your favourite ingredients. These energy bars were delicious. 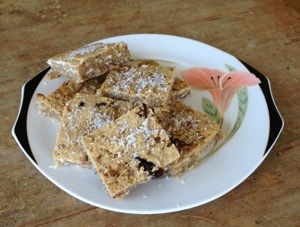 I made them chewy (easier to eat when running) although if I wanted to I could have cooked them slower & made them crunchy. In my house, the real proof is whether or not my kids will eat them. My kids must love them as I caught both of them trying to sneak some more after I had said no more. My daughter even asked if they could be her lunchbox treat at school. That’s a real win to have her think of a sugar-free recipe as a treat. I’m looking forward to trying more combinations. As my mileage slowly increases each week, I’m starting to need to think more about fuelling my long-runs. Part of my challenge is that I gave up eating sugar approximately 18 months ago, which is one of the best health decisions I’ve ever made. Stay tuned for another post following soon with my experiences of going sugar-free. Being sugar-free means that many of the common methods of fuelling, such as energy gels, bars and sports drinks are not suitable for me to use as a running-fuel. Having tried to stick to my whole food diet as much as possible (see previous post, Whole Food Binge), I’m looking for whole food alternatives as much as possible. In my research, I came across Matt Frazier, who runs a blog called ‘No Meat Athlete’. While I’m not vegetarian, and have no interest in becoming one, he and his co-bloggers share some amazing recipes on homemade energy gels, bars, smoothies and drinks. The first I intend to try is the Energy Bar formula which boasts a comprehensive guide for making an energy bar using a mix & match approach. I also came across this great article, How not to Bonk in a Marathon by Jeff Gaudette, whose online training plan I am currently following. He explains why and how the body can sometimes reject fuelling during a run. It’s very informative, check it out. So far, I’ve been using raisins, having a small handful towards the end of the first hour. As I’m not yet running longer than 90 minutes, I’ve only been fuelling once in the run. Next weekend I’m tackling 18km, my furthest yet, so will try the raisins again, as they’ve been working for me so far, but I’m sure I could easily get sick of them! My current plan is to aim for 100 calories per hour. So, tomorrow, I’m off on my long run, raisins at the ready…. we’ll see how I go. One week away from my kids for work, and I’ve decided it’s a great opportunity to try eating better. We generally eat pretty well, but I’ve challenged myself to eat only whole foods, with minimal processing. Okay, I know that maybe the hummus is cheating (but I can’t really live without it). This is what I’ve bought for my cupboard this week: eggs, chia, quinoa, veggies & fruit, yoghurt, milk, beef, olive oil (for cooking) and the cheeky hummus. I’m not going to say it has been easy. I’m getting up early to make a fritatta or omelette each morning (not enjoying the washing up! ), and I’ve been a bit time-poor so have had to buy a few meals, but I’ve managed to stick to salads when I’m out. It’s definitely worth it though! I feel fantastic, I’ve had some great runs and my skin looks amazing. Definitely something worth trying to continue when I get home, although I don’t think my family can live without a good pasta once a week.